"I love this recipe and it tastes good with tortilla chips." 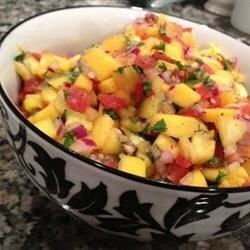 Stir the tomatoes, mango, onion, sugar, cilantro, lime juice, cider vinegar, salt, pepper, and garlic together in a bowl; refrigerate 1 hour before serving. I use a very similar recipe and LOVE it! The main difference is I use red onions and try like heck to let it sit overnight..wonderful! I added black beans and fresh summer corn off the cob. I did not add sugar b/c my mangos were quite ripe and sweet on their own. Loved it and will make again... Less the garlic! The mango I used was just the right amount of ripe. This was absolutely delicious! Served with tortilla chips. My new must-have for parties.